A really smart, really insightful review of Homeward Bound by Ann Friedman (I’m a huge fan of her hilarious pie charts) in The New Republic. 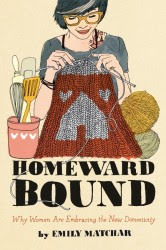 The brilliance of Emily Matchar’s new book, Homeward Bound: Why Women Are Embracing the New Domesticity, is that it exhaustively describes what disillusioned workers are opting into: a slower, more sustainable, and more self-sufficient lifestyle that’s focused on the home. The woman who leaves the public workplace is “the Brooklyn hipster who quit her PR job to sell hand-knitted scarves at craft fairs,” Matchar writes. “She’s the dreadlocked ‘radical homemaker’ who raises her own chickens to reduce her carbon footprint. She’s the thirty-one-year-old new mom who starts an artisan cupcake company from her home kitchen rather than return to her law firm. He’s the hard-driven Ivy Leaguer fleeing corporate life for a Vermont farm.” Though the vast majority of Machar’s subjects are women, this is not just a story about gender roles. It’s about what happens when the structures we were raised to buy into don’t provide what they were supposed to provide, and the alternative values that have, for a growing subset of Americans, come to replace them. If this makes you want to read Homeward Bound, there are 26 days until publication! Pre-order now at Amazon or IndieBound. Now I wouldn’t go as far as saying that everyone in this movement does it because of the work-place conditions. I personally just do it because I am not interested in a job in the first place, no matter the conditions – I just want to be home with my kids, and a lot of people are like that. Being a working mom is not a default choice and being a stay at home mom is not a failure to thrive in the work place. Some folks who can afford (like us, at least for now) just love these traditional roles. who can afford this lifestyle, meaning. Actually all of the diy makes it a whole lot more affordable, like you never need to buy meat, ever.